Today the O'Loughlin family descended on Croke Park to support Mayo in the All-Ireland Senior Football semi-final against the men from Tyrone. 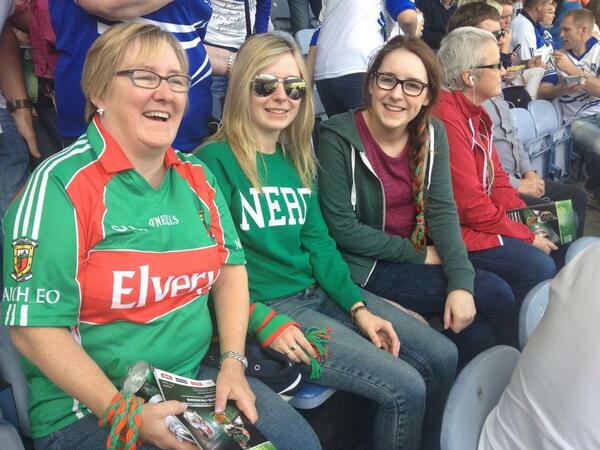 Along with a crowd of over 65,000 we enjoyed some great football, and of course a win for Mayo. Roma is a native of Mayo, so she proudly wore her the shirt of her native county. Not to be out done, I wore my Wicklow jersey! Mayo were deserved winners, though did not play well for most of the first half. In the second half battle of midfield, Mayo's O'Shea brothers dominated Tyrone's Kavanagh brothers. One sad thing to see was the great Stephen O'Neill of Tyrone leaving the field early on - will we see him in Croke Park again? Next Sunday we will go along to see the opposition in the final when Dublin face Kerry in the other semi-final. Whoever wins that will have a serious challenge from the Mayo men who were victorious today. A really enjoyable day out when once again team followers from each county mixed with each other in the ground. We had some passionate and noisy Tyrone fans behind us, and some (large) Mayo men in front of us. Where else would you get such a mix and not feel intimidated? Back To Work with a Sharpened Axe!